We recently had the chance to catch up with John Ochs – Managing Director, APM Terminals Pier 400, which handles approximately 1.6 million TEU and is the largest single proprietary terminal in the world. With a total of 484 acres, APM can accommodate 8,000 wheeled and 17,000 grounded containers. We asked John about Pier 400’s recently rolled out appointment system, how things have been going for APM this year and how 2011 is looking for the terminals at the Ports of Los Angeles and Long Beach. PierPASS: Why did you decide to roll out an appointment system earlier this year at Pier 400? John: The TermPoint system allows us to better understand what volume of drayage truckers to expect on any given shift. We can then adjust our labor order to provide the appropriate number of equipment operators to service the truckers. Additionally, an appointment system allows us to distribute the volume of drivers throughout the entire shift. The result is a reduction of queue time, as there is not a surge of truckers attempting to get serviced at the start of the shift. PierPASS: How does the appointment system work and how does it affect the truckers coming through your terminal? John: The system allows trucking companies to make appointments once containers are discharged. The effect on the trucking community is the need to monitor their containers and plan their deliveries to ensure they secure appointment times that best meet their business needs. Our system has been well received by the trucking community and, since the implementation, our data has shown reduced turntimes, which is a huge benefit to truckers using Pier 400. PierPASS: How will the appointment system increase efficiency at APM? John: Again, the appointment system provides us the visibility of what volume/activity to expect. The system also provides us the ability to know where to position our CHE (container handling equipment), therefore providing efficient and timely service throughout the shift. PierPASS: What other measures have you implemented this year to handle increased traffic in your terminal? John: We have reallocated the use of our truck gates to better segregate truck traffic for import and exports. PierPASS: What is your outlook for 2011? John: The cargo volume forecast for the first quarter is relatively stable, and Chinese New Year is early this year. The entire industry is awaiting the forecast for the second quarter with great anticipation. 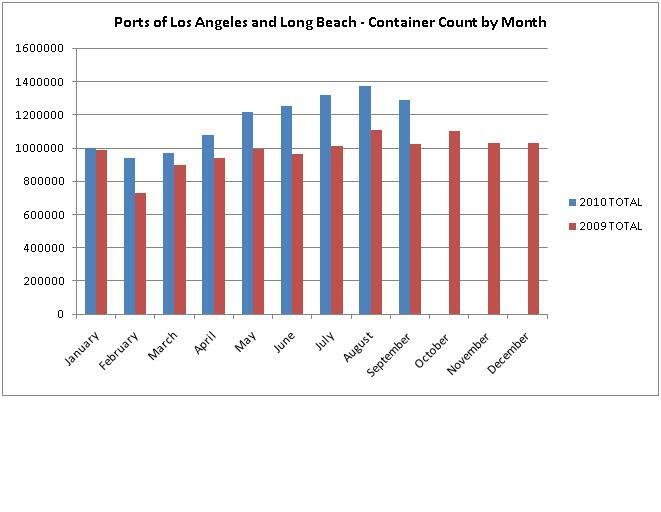 October cargo volume at the ports of Los Angeles and Long Beach has increased slightly from September volumes, following the peak holiday shipping season. The October volumes are well above the depressed levels we experienced in 2009. We are expecting lower volumes to continue through the Chinese New Year and Q1. Please check back for monthly updates on cargo volume statistics for the San Pedro Bay ports. We recently had the chance to catch up with Josh Owen – President of Ability/Tri-Modal, a third generation privately held trucking, warehousing and distribution company that has serviced the Southern California gateway for international cargo since 1947. We asked Josh how things have been going for his company this year and how 2011 is looking for the trucking community. PierPASS: When we last spoke, you had seen an improvement in truck congestion at the ports of LA and Long Beach – tell us about the changes you’ve seen. Josh: We really got hit this summer with higher cargo volumes – congestion was bad. When you look at the cargo volumes from last year, we really started to see an increase beginning in April, which peaked in June with a 36% increase in volume over 2009. This really caught the shipping and trucking companies, ports and terminal operators off guard. But we’ve seen great improvements lately and congestion has really leveled out at LA and Long Beach. Terminals have returned to five OffPeak shifts, reinstated continuous operations through the lunch hour and expanded hours by adding back flex gates during those congested times. My company saw a jump from 1.9 turns (pickups or deliveries) in June to 3.6 – 3.9 in August. That’s huge. The best gauge that I have that things have gotten better is that I don’t hear my dispatch complaining that much! The latest I hear is that we’re now running out of warehouse space, which is a good thing. PierPASS: How have issues of congestion affected business for the trucking industry this year? Josh: This past year has really been a learning curve for all of us and has forced the community to come together and discuss solutions to issues that affect all of us. I think the formation of the working group I’m currently co-chairing with PierPASS has helped remedy some of the issues we’ve been faced with this past year. Now we have positioned ourselves to have open lines of communications and have a process in place so we can work together from now on – in good and bad times. PierPASS: Tell us more about the working group – what are some of the topics or issues you are focusing on now? Josh: The surge in cargo volumes and increased congestion of the ports has really pushed us, as a community, to look to the future and plan ahead for these dips and lulls better than we have in the past. One of the concerns of the future is if we do have a dip in cargo volumes again, that the same issues will resurface again if we handle the situation the same as we did last year by closing gates. We need to plan ahead for future slumps as well as future increases to ensure continued productivity at the ports. PierPASS: How did the cargo volume during the 2010 holiday shipping season compare to 2009? Josh: It is definitely up this year, but that’s because everything is. The peak season came really early this year– in May, June, July – following retailers’ needs to replenish their inventories after demand picked up post-2009. I think everyone now is very cautious to see how the buying season goes. There is so much at play in the retail world. If retailers aren’t doing well, we aren’t doing well. PierPASS: What is your outlook for the industry – and your company – in 2011? Josh: if I can predict what we can expect next year, I would! I think we need to be patient moving forward. Measuring growth is really accomplished by looking in the rear view mirror. Let’s give it two or three more quarters to see how the midterm elections, the housing market and unemployment rates affect American’s buying patterns. If people don’t have homes, they won’t be buying the furniture that comes through our ports. We also have to factor in that there are going to be big changes in power in the Committee on Transportation and Infrastructure, which will have a huge impact on the transportation infrastructure. The safe bet is to be cautiously optimistic. 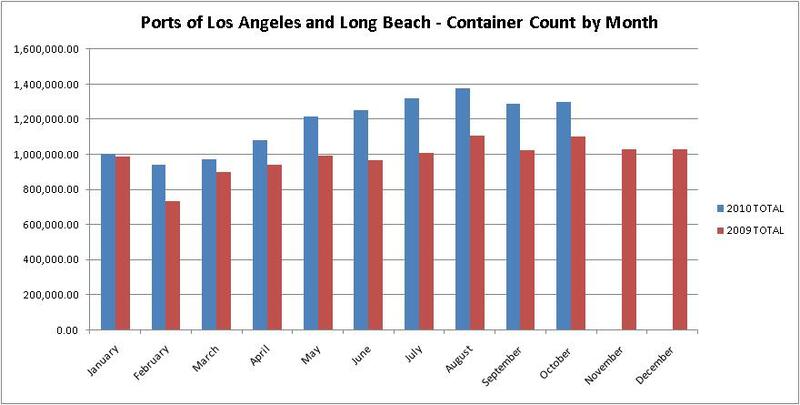 September cargo volume at the ports of Los Angeles and Long Beach has dropped slightly from the 2010 high in August. As the end of the peak shipping season nears, we can expect to see cargo volume flatten through the remainder of 2010 and likely into the first quarter of 2011. The good news is that volume is still above the depressed levels we experienced in 2009. Check back for monthly updates on cargo volume statistics for the San Pedro Bay ports. Check out PierPASS’s updated live camera feeds showing different marine terminal gates at the Ports of Los Angeles and Long Beach. We have updated the page to make it more user friendly. Click on any of the images to see a larger view. We are continuing to update the page with additional camera views from all terminals to help LMCs monitor congestion levels at the terminal gates. Click refresh on the page to get updated live images from the terminal gates. Welcome to PierPASS’s latest resource – live camera feeds showing different marine terminals at the Ports of Los Angeles and Long Beach. We’re hoping that these camera views will help Licensed Motor Carriers gauge congestion levels and make informed decisions on when to send drivers to different marine terminals. We are continuing to update this page with additional cameras from all terminals and will keep you updated as we do. Click refresh on this page to get updated live images from the terminal gates. Overall feedback from our working group was that the measures taken by marine terminal operators to combat congestion and gridlock at the Ports of Los Angeles and Long Beach are working – a positive step forward for everyone. Twelve of the 13 terminal operators have added back a fifth OffPeak gate, and most terminals have also reinstituted flex gates, where they remain open during lunch hours and breaks rather than shut down and start back up again. However, there is still a lot of work that needs to be done. At the top of the list of priorities for the working group? Agreeing on how to measure turn times and identifying ways to improve them. Without industry agreement on what constitutes turn times at port terminals and how long the process should take, it will be difficult to establish long-term practices to address issues of congestion and wait time. Now with many terminals investing in computerized and automated systems, it becomes easier to produce data on how long each truck is inside the terminal. However, we still need to work together to identify potential solutions to wait times outside the terminal gates to paint an overall picture on how to reduce overall wait time for the trucking community. We’re encouraged by the progress of these working group meetings and are committed to keeping Southern California moving. Stay tuned for more working group updates. The MTOs at the ports of Los Angeles and Long Beach have been taking measures to manage gate congestion as a result of increased cargo volumes. Watch what’s being done to improve efficiency and ensure cargo flows smoothly. The second working group meeting took place this past Monday. The conversation was lively, thoughtful and productive. I’ve asked Joshua Owen, president of Ability-TriModal, a trucking, warehousing and distribution company, to co-chair the working group with me. Ability-TriModal has served Southern California for more than six decades, and Joshua brings deep knowledge and experience in the industry. Through our discussions, we’ve realized there are a number of differences and similarities among the stakeholders. Most crucial to reducing truck congestion is the fact that we each define the issue differently and we each have different tracking and reporting methods (click here to see how PierPASS reports transaction data). So we created a sub-committee to address terminology across all stakeholders and to look at the possibility of combining data from GPS and RFID technologies to enhance reporting on trucker wait times outside of the terminal gates. But there are several things we all agree on. No. 1 on the list is our commitment to improving efficiency. Each member of the working group has expressed their continued support to ensuring cargo flows efficiently through the ports. The MTOs recently announced they are adding back a fifth OffPeak gate at 11 of 13 marine terminal gates and the reinstatement of the noon hour relief and early start of night shifts. I am encouraged by the support offered by each of the stakeholders and am confidant that together we will keep Southern California moving. Stay tuned for more working group updates.